The DustyBlues vinyl banners used to direct visitors to the art gallery. Valerie and Dusty Scott of DustyBlues Photography Gallery. DustyBlues Photography Gallery is the husband and wife team of Valerie & Dusty Scott. Our artwork is on display in many countries throughout the world in both public and private collections. We are located in the Hocking Hills of southern Ohio, a nature’s wonderland attracting 2+ million visitors a year. As seasoned IT professionals from our previous life we were driven by our desires to create art from nature’s landscape. After 15 years of honing our artistic skills in performance and urban landscape photography, we launched our new business into fine art photography and digital photographic services focusing on nature’s beauty. We recently opened the DustyBlues Art gallery in February of 2017 in a beautiful country setting. It is a perfect fit for us as we both love nature. With Dusty’s dairy farm childhood experience and Val’s green thumb we are rejuvenating the land of an old sheep farm. As we settle into our new found life we continue to grow in our business and expand the services of our gallery. 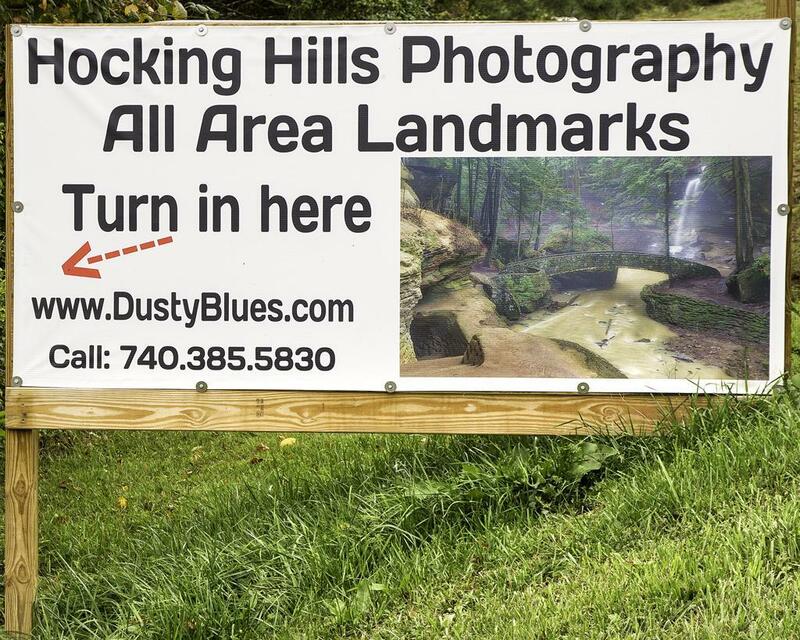 DustyBlues creates fine art photography of the natural landscapes of the Hocking Hills as well as provide commercial services, primarily to the 1600 cabins owned and managed in this region and license images through a reseller network. We have a small line of graphic design services producing signage for clients. Our gallery caters to art collectors and visitors to the area. Our larger pieces are offered in canvas, acrylic, aluminum and framed art and the visitors are attracted to the mattes and greeting cards for gift giving and memories. Our expansion plans for 2018 include offering our National Parks portfolios and expanding on our nostalgia collection. We will continue to explore other offerings as we see a demand for them as we grow. DustyBlues originally was conceived to capture and provide photographic services and artwork based on the performance photography of the blues realm. Over time the demise of many of the original artists and the sustainability of this market led us to transcend our focus towards more of the natural world. How did you determine the customer desire for your photographic services and artwork? Developing our commercial services, we were able to define the best initial audience to focus on, create methods for addressing them and brainstorm ideas for our marketing message to that audience. We also had portfolios of images that we could use in our marketing to prove our skills were up to the tasks they required. Once we began to interact with our initial respondents, we would use probing questions to understand their needs. We would also create awareness of our additional talents/skills that we could provide. This led to them often expanding their requirements, either initially or over time. From there we made sure to provide them with much more than they requested, at a fair price for our market, and in a pleasant manner. This has led to additional sales as word of mouth in a close-knit community and within a target segment that interacted with each other. Another aspect was our ability to cross-promote each other’s efforts. We promote them in our gallery and they place our marketing brochures in theirs. This gives more credence to each other and is a win-win for both. In the Hocking Hills we are the only photographic gallery available to the tourist and locals. Our focus on producing each piece, from the composition to the finished artwork for display, allows us to control the high-quality standards our passion demands. This allows our finished gallery artwork to have the utmost precision of color consistency, detailing and print sharpness which our clientele appreciate. Our commercial work, including graphic design services, studio services, and art restoration, is another area where our pride in capture and production for our clients is unsurpassed. This has begun a word of mouth consideration of marketing in this tight-knit community. The Tourism industry leverages rack card marketing. We have found our rack cards are more successful in attracting customers when they are placed directly in the rental cabins. We achieve the placement of the rack cards by networking with the cabin owners and developing a business relationship. Our sales volume from this activity is about 20%. While we have also marketed ourselves using a number of other methods, we always ask our visitors how they are aware of us and a high degree say they saw our signs. 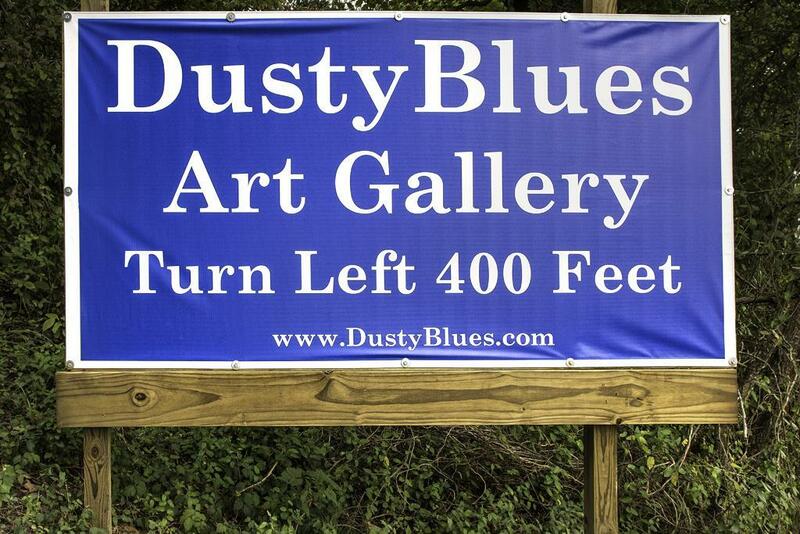 A vinyl banner, attached to wooden posts, outside the DustyBlues Photography Gallery welcomes visitors. We have been working on enhancing our social media marketing strategy to attract and develop an awareness of our product line. Our goal in 2018 is to increase our ROI through gallery and website sales using various social media platforms. We now have enough information from this past year that will allow us to focus on our targeted market and track our success by leveraging the analytic tools available online and adjusting as needed. Our biggest commercial photography competitors are located in the metropolitan area more than 50 plus miles away from the customer. By living in the rural tourism area and providing the local convenience of time and travel, our costs are more appealing with the same or higher quality of end product. Our gallery is local and where the tourists pass continually. Other competitors for our local nature artworks are web-based and it goes a long way to having the art in your hands and viewing it up close to sense what it will look like in their home or office versus trying to attain this on a computer monitor or mobile device. As artists, we have only competed with ourselves. There are other local photographers who have their own style in creating art. Each customer purchases art based on their attraction to the art. We believe our social media marketing strategy will set us apart from others. Our goal is to enjoy our business and provide inspirational art from nature. What recommendations would you have for small businesses when it comes to social media strategy? Each small business defines itself and the struggles of each. Each has particular needs and goals and the effort requires incessant dedication and focus just to survive. To this end, each small business management team truly needs to embrace and continually understand the role social media can affect them, both positively and negatively. That stated, the vastness of social media and the relevance of each “service” can overwhelm your limited resources. On top of this growing phenomenon and often misleading are those who claim to be “the experts” in helping, only to make it difficult in defining whose voice is worth listening to. At DustyBlues we use our knowledge gained over experiences at major corporations to consider our intended optimal practices. Understand that a continual refresh of each with relevant content that pushes your message is required. Use of at least one of the major platforms to provide marketing inclusion targeted at your “well defined” audience (demographics), with “well defined” message (keywords) at “well defined” (geographic/presence). Set a budget for this and then use the services’ analytics to evaluate impact as well as working with customers to elicit their awareness of your product/service to ensure you are maximizing its effectiveness. Try several campaigns to gauge audience/message/presence impact and work to optimize ROI. We find a well-tailored campaign delivers bottom line results that are multiples of the cost of the services. We also poll other local business owners to gauge their usage and effectiveness and this allows us to better streamline our campaigns and also provide solace that we are approaching this effort well. With other social media such as Google Posts, Twitter, Facebook, etc. make sure you create and maintain a continual fresh presence on each. A great way to develop this even more is working with aligned companies to develop interactive social contacts such that each helps broaden your audience and gives authority to both of your efforts. Stay positive and address any efforts taken to sully your business name that are untruths. Our biggest challenge was constructing and bringing online a commercial building on time and under budget yet having no experience with commercial building construction. Our experience in corporate America trained us very well to handle the diversified workforce of tradesmen, project planning, and conflict resolution. Through best practices, perseverance, and creativity we accomplished this goal successfully. What experiences and lessons learned from your time in corporate America have you taken and applied to your business? We both developed many insights from our years in corporate life. Often these are very similar but, on occasion, we each had unique experiences and lessons that we can now pool together and use as effective as possible to enhance our gallery business efforts. We both spent many years developing project management skills with considerable depth and these now allow us to A) Utilize task sets that align with our skills and personalities. This allows us to maximize our strengths and weaknesses. B) We are cognizant of areas of control and where we must rely on others to accomplish our goals and how to best approach these, both initially and over time as results develop and changes are required. Ability to address people well – on the phone, in person or addressing an audience. Purchasing skills to continually hone our raw materials to enhance our bottom line and maintain adequate margins. Time management, when to hold em and when to fold em. Prioritization of efforts and minimizing Company ADD. Quality control and how attaining and always delivering your best effort is totally important; under promise and over deliver. That family and friends are too important in life and that burnout is perhaps the worst counterproductive thing that can happen. Smell the roses, enjoy the successes, and learn from the failures. Dusty would have worked harder and smarter earlier in life to get where we are sooner. Life is a learning experience and the experience is what makes your life. Sometimes I wish I would have followed my love for nature sooner than later. Stay focused, deliver exemplary service and continually analyze and adjust your marketing plans using common sense logic. Understand and develop your social media interactions with your existing and targeted customer audience. Many people will provide you product ideas they believe you should have that is not part of your portfolio of products, listen wisely. Stay focused on YOUR mission. Distractions can be costly in time and money. If you are technically challenged, become educated on the use of technology for your business. It is here to stay. Our physical gallery holds artworks that reflect our unique style of expressiveness with vivid colors and artistic touches that bring each piece to life. Our promise to deliver only the highest quality product at exceptional prices has provided positive feedback from our clients, patrons and collectors of great satisfaction. We continue to strive to always raise this bar as goals for ourselves. We received many words of encouragement from our local small business associates and the one that sticks with us is, “the first year is always the toughest.” As we head into the final leg of this year, we expect to weather the initial year quite well. We plan to continue to improve and grow our gallery based on learned insights and improved marketing efforts. Our commercial service interests continues to grow and we enjoy customer growth based on word of mouth marketing in the area. While we spent limited amount of time marketing our reseller and image licensing services, we anticipate doubling our sales based on this year’s activities. Since we love what we do, invoking creativity and focused on the business development, we anticipate a productive future for our lines of services. Our commercial services grew by 50% this year and will continue based on the tourism business and knowledge of our services. Since this was the first year of our gallery, we base our growth numbers for next year analyzed from our proven successes and insights gathered this year. 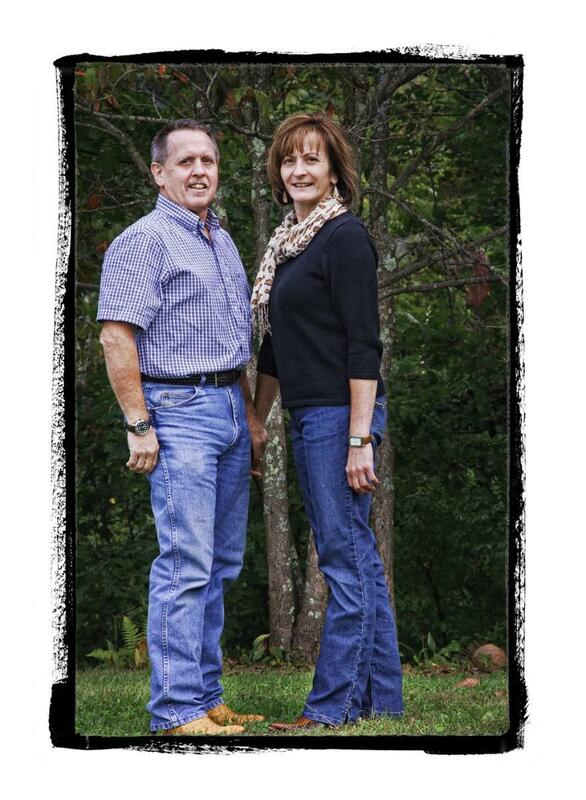 Editor’s Note: We’d like to thank Val and Dusty for their wealth of knowledge for operating a small business. 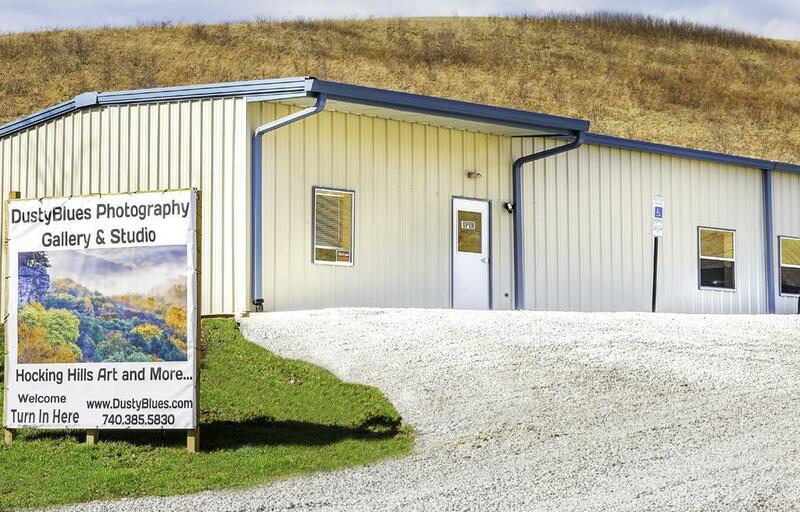 DustyBlues photography Gallery is an excellent example of a business utilizing physical advertising and digital marketing – specifically social media – to draw in visitors from around the world. Signage has played a crucial role in spreading local awareness in the business’ first year, contributing to 75% of sales from visitors. Embracing social media using audience specific keywords and geographic targeting, while setting a specific marketing budget has helped to improve the ROI of the business. Incorporating project management skills with their passion for photography allowed the couple create a one-of-a-kind photography gallery in the Hocking Hills. We wish Val and Dusty the best of luck and success in the coming years as they continue to grow the DustyBlues Photography Gallery.